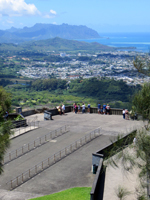 Nuuanu Pali Lookout: Discover Hawaii History and Scenic Hawaii Sightseeing. 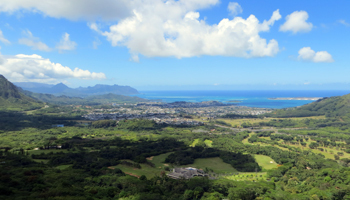 Pali Lookout: Discover Windward Oahu & Hawaii History! There’s not a lot to do at the Nuuanu Pali Lookout; but on a clear day, it’s hard to beat the view! It’s a short walk from the parking lot to the lookout, from which you will be able to see a 180-degree panorama of Hawaii sights from Kaaawa (pronounced: kah-ah-ah-vah) and Chinaman's Hat to Kailua Beach. On a clear day, Kaneohe Bay is just gorgeous. And for those of you old enough to remember… see if you can spot Gilligan’s Island (actually called Coconut Island). It’s the biggest island in Kaneohe bay, right up close to the shore nearest the lookout. Although the title shot for the show was taken at sea level, you'll probably easily recognize the distinctive silhouette (which I liken to the profile of a battleship). I suspect your kids will enjoy the wind even more than the view. 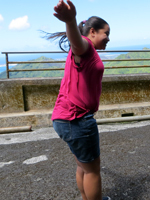 The wind absolutely roars through the mountain pass where Nuuanu Pali Lookout is located. If you’re wearing a hat, you won’t be for long. And if you decide to throw a penny out over the abyss, just make sure there’s nobody standing 25 feet behind you, because he’s likely to get mad when your coin blows back and hits him! 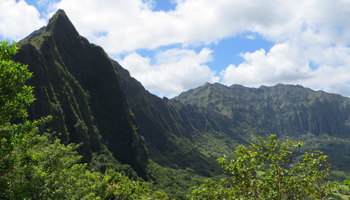 In addition to the natural wonders, Pali Lookout also has Hawaii historical significance. In 1795, King Kamehameha the Great conquered the island of Oahu at this location by literally driving Oahu’s armies over the cliff to their deaths (which may explain why both the top and bottom of the cliff have ghost stories associated with the locations). Once you’ve had your fill of looking out over Windward Oahu and leaning into the wind at an improbable angle, you can wander around the area a bit. 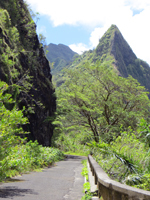 If you go to the right of the lookout, you can walk down the Old Pali Road, which used to be the only highway through the mountains from Honolulu to Kaneohe. You can also climb a little way up the mountain behind the lookout and to the left (when facing the parking lot), which will give you a view of the lookout and the scenery beyond. To get to the Pali Lookout, take Pali Highway (Route 61) heading up the mountain. From either direction, the exit to the lookout is on the Honolulu side of the Pali tunnels. Going Kailua-bound, the lookout exit is immediately before the tunnels. Going Honolulu-bound, it’s approximately one mile past the tunnels. The lookout is free; but I recently discovered that the parking now costs $3 per car for non-residents. Yeah, I know… that’s kind of lame. The tradeoff, however, is that the attendant who checks for resident ID’s and enforces payment might also help discourage vehicle break-ins. Nevertheless, I would recommend against leaving valuables out in plain sight inside your car. Disclaimer: Climbing over the railings to lean out into the wind will result in a very long fall with an exceptionally hard landing. The wind will NOT be strong enough to keep you from falling, so don’t be stupid. If you do stray off and explore the area around the lookout, be careful and heed warning signs. Remember that you’re on the edge of a very steep, gusty, rain-slicked 1,000-foot cliff where 400 Hawaiian warriors plummeted to their demise; and death is a bad way to end your Hawaii vacation. Stay alive and enjoy more Oahu Hawaii activities!